The partners continued to create and sell household products through an innovative direct sales model of selling directly to customers without a middleman. This evolved into the “pyramid” selling technique established by Amway in their health and beauty products. By 1967 Amway sales reached $50 million as Rich DeVos pioneered the “Selling America” campaign to inspire a new consumer based country. Amway’s first international office was in Canada in 1962 but by 1970s Amway added eight other international markets including Australia as well as expanding the headquarters in Ada to almost one million square feet. During this time, Amway battled with the U.S. government regarding their “pyramid scheme” selling technique. 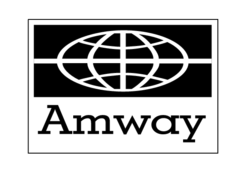 In 1979 the Federal Trade Commission ruled that Amway was not a pyramid scheme, allowing Amway to continue their success and develop new and innovative business systems. By 1980 Amway reaches the $1 billion sales mark and became one of the largest companies in the world with more than 1 million distributors globally. The 1980s weren’t free of controversy for Amway as they faced international conflicts, battles with the IRS, and a poor public perception. This pushed the Amway Distributors Association to establish 10 rules to enforce and establish new distributor conduct with products and customers. Amway has continued to establish their international business reach and has markets in 59 different countries across the world. Alticor, the private parent company of Amway, was established in 2000 and is run by the DeVos and Van Andel families in unison with the other company holdings including Access Business Group and Alticor Corporate Enterprises. The Van Andel and DeVos families have been the most significant sponsors, donors, and economic leaders in West Michigan. Their investment has revitalized Ada and much of the surrounding Grand Rapids area. Their names are spread across multiple landmarks in the area including the Van Andel Area, DeVos Place convention center, Amway Grand Plaza Hotel, Helen DeVos Children’s Hospital, and Van Andel Institute. Members of the DeVos and Van Andel families still reside in Ada today.